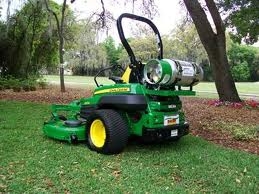 Commercial lawn services benefit from switching to propane. Save 30 percent on fuel costs and decrease environmental impact. Changing over your fleet of lawn mowers to propane can save money for your company and increase your business across the Valley. Many commercial properties are looking for ways to become more environmentally friendly. With propane costing less than gas or diesel companies save money on lawn services. Also, propane lawn equipment requires much less maintenance than the typical gas mower. For example, propane mowers can run approximately 100 hours before they require an oil change and they produce almost 50% fewer greenhouse gas emissions. This is good for you and for the environment!